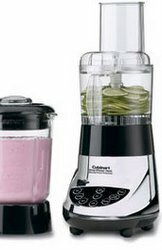 Cuisinart SmartPower Duet Blender / Food Processor - Chrome. Cover with feed tube and pusher with liquid dispenser. Food processor button provides the perfect speed for processing foods. Price $80 Based on the manufacturer's suggested retail price (MSRP), this blender is PRICED ABOUT AVERAGE when compared to all other blenders. Watts The BL10450H is LESS POWERFUL THAN AVERAGE and ranks in the BOTTOM 1% of all blenders. Stars Based on actual user experience and reviews, this blender is RATED LOWER THAN AVERAGE by 106 USERS and ranks in the BOTTOM 10% of all blenders. 36% of users rate this blender favorably. Not only does it slice veggies so thin, they might as well been puree, but more seriously, the plastic bowl cracked from the center where it sits on the spindle. Quite a disappointing product. What a piece of junk! I used it maybe four or five times before it broke. I know that food processors and blenders are inherently louder than regular appliances, but this is louder than most lawn mowers. Pretty disappointed. The single biggest drawback is the noise. The blender is so loud it scares our pets into hiding. It's so loud that it is certainly a safety issue, and might damage someone's hearing.